As I gaze towards the outlines of the scattered buildings in front of me I marvel at how uninviting they look in the half-light of a cold, grey morning. 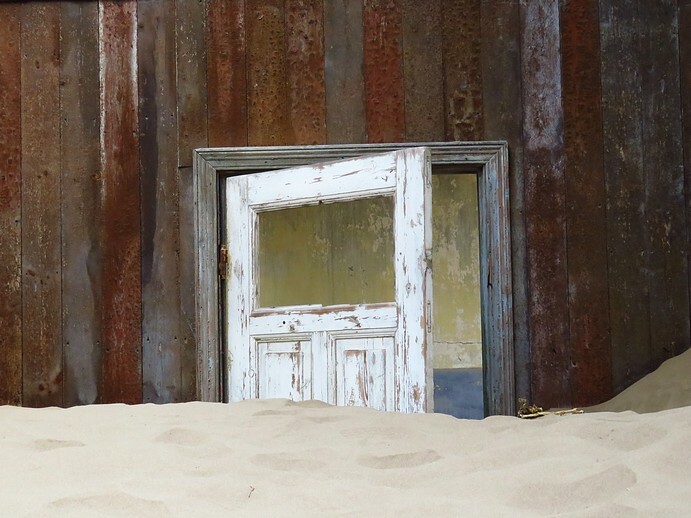 I’ve long dreamed of visiting Kolmanskop in this tucked away corner of Namibia, but for a brief moment as I hover outside the gate I fail to experience the tingle of excitement I expected to feel. I shrug off my disappointment, pull my jacket closer to my body to brace myself against the wind, and head towards where the buildings peter out at the edge of what was once one of the richest towns on earth. Nothing remains of the European luxuries that once abound in Kolmanskop. 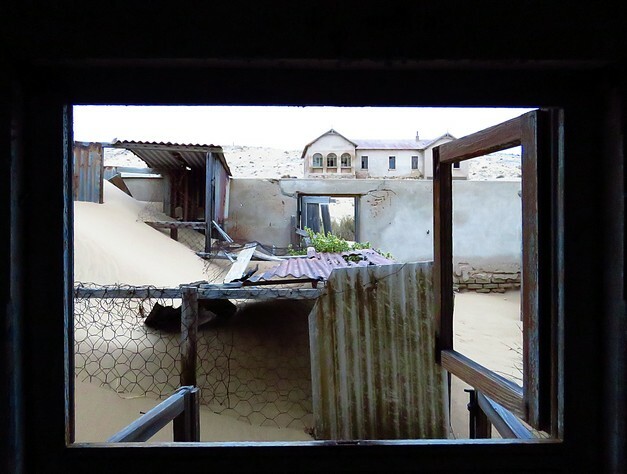 The hospital which is said to have housed the first X-ray machine in Southern Africa now hunker down against the onslaught of a persistent wind, and while the theater, ballroom, sports hall with skittles alley, and ice factory have been partially restored, the rest of the town is slowly being swallowed by the Namib Desert. The small tram line that was constructed to help residents avoid the inconvenience of trudging through sand, and the champagne, fresh caviar and strawberries that could be found in the local grocery store, now feel more like figments of someone’s imagination than the truth. The wheels of fate Zacharias Lewala set in motion on an ordinary workday in April 1908, when he showed his boss the strange stone he picked up while working on the railway line at Grasplatz have not only changed the fortunes of the people who got sucked into the ensuing diamond rush to this inhospitable place, but also the landscape. Although diamonds were discovered in a variety of places in the area, it was Kolmanskop that became the centre of the thriving industry. It is said that diamonds were so prolific in Märchental, or Fairytale Valley, close to Pomona that diamonds were twinkling like stars in the moonlight, and that workers crawled around on their hands and knees picking them up with tweezers from among the rocks and dust. In a rather bizarre attempt to prevent theft the workers were said to have been locked up for the night in sleeping quarters that resembled coffins. The scarcity of water did not dampen development. A monthly supply of a thousand tons of fresh water was initially shipped to Kolmanskop all the way from the Cape in South Africa, until the problem was solved by an underground aquifer that was found at Grillental which fed four boreholes that could then supply the surrounding mines and settlements with the fresh water they needed. At a time when one out of every five diamonds in the world came from the area, 300 hundred German adults, 40 children, and 800 Ovambo workers called Kolmanskop home. But the boom was short lived, and with the changing fates of the World Wars, depression, and discovery of higher deposits of alluvial diamonds in Oranjemund, mining in Kolmanskop ceased in 1930. Walking through the remains of this one’s thriving community it is hard to fathom the excesses and luxuries that coloured daily life, although hints linger in the architecture, fittings, fading patterns and colours on the walls, and peeling wallpaper. The notes of the resident orchestra have been replaced by the moan of the wind, the saltwater swimming pool has been emptied by the rays of the sun; and the memory of children’s laughter echo only in my mind and not the empty school building I shuffle through. No longer controlled by the whims of human hearts and hands, the desert is gradually returning to its original state of equilibrium, or at least doing its best to do so. The gardens with their manicured lawns, rosebushes and eucalyptus trees would have been the first to disappear. In all likelihood long before the last couple of families eventually left town in 1956. Its current inhabitants, those tiny critters who come out after the heavy footsteps of the tourists have retreated for the day, don’t care about the past, or changing fortunes of those who once dreamed and laughed here. Their tiny imprints on the sand, and subtle interplay of light and shadow, both inside and outside the crumbling buildings, fill me with a nostalgic sadness as I am reminded of just how fleeting our presence on earth really is. When I leave the last crumbling mansion, I think of Zacharias Lewala, and wonder if he also managed to make his fortune. If he did, history is silent about it, as it was his boss, August Stauch that in the end got credited for discovering the rich diamond fields, and who became a very wealthy man. For a while at least, because in a twist of irony he lost his fortune in 1931, and died a poor man in April 1947 in his home town of Ettenhausen in Germany of stomach cancer. ** Click on any image to view bigger versions of the photographs. Entrance fee is N$100 for adults, and N$20 for children (6-14 years). 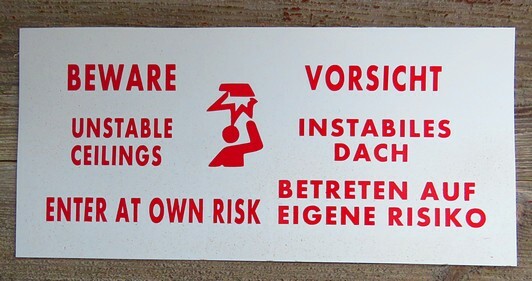 Remember to be sensible when exploring the buildings, and to dress appropriately for the conditions. # Mining operations included Charlottental, Meob, Conception Bay, Grillenthal, Bogenfels, Elizabeth Bay and Pomona, where abandoned buildings face the same fate as those in Kolmanskop, but as they are in the Sperrgebiet (prohibited area), where mining operations continue today, it is not possible to visit them independently. 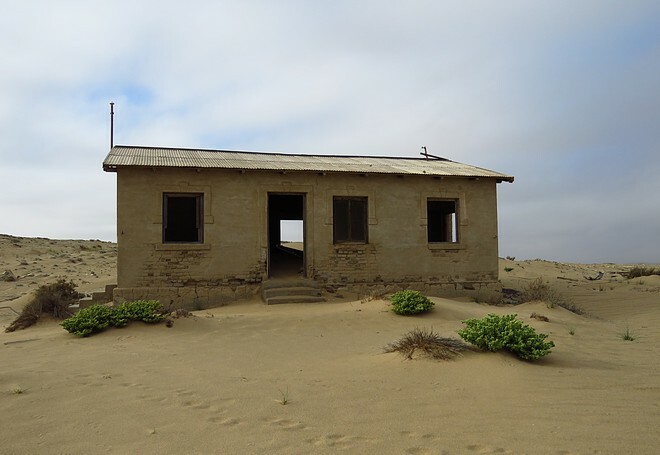 Coastways Tours in Lüderitz does hold a concession for a tour into the Sperrgebiet, which, since February 2009, is also a National Park, and includes a visit to Pomona ghost town, which clocks the highest average wind speeds in Southern Africa. This is not a tour you can decide on at the spur of the moment, though, as you need to send them a copy of your passport at least a week in advance for them to arrange the appropriate permits. # What is today known as Lüderitz was historically called Angra Pequena (Little Bay) by the Portuguese explorers who happened upon it in 1488. 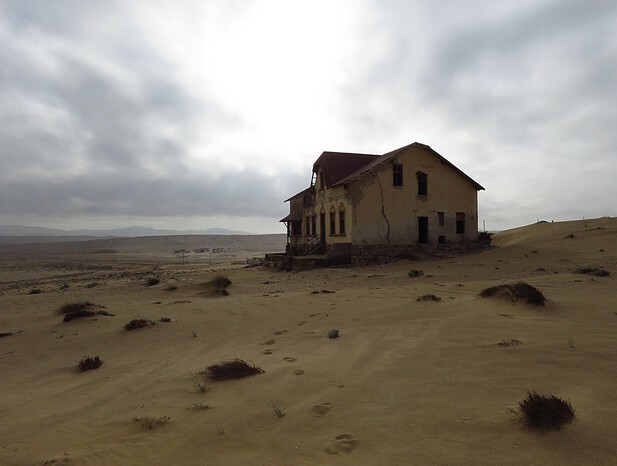 It makes for a great base to explore the area (Kolmanskop is only 11km out of town), and is a lovely town to discover on foot if the wind isn’t blowing. Spend at least two nights here, as both Felsenkirche and Goerke Haus are only open for an hour or two a day. # There is something about abandoned places that stir my soul, especially when I find myself completely alone in them, as I did in Kolmanskop. Other favourite abandoned villages of mine are Kayakoy in Turkey, and Jazirat al Hamra in the UAE. Oh my God! These photos give me goosebumps. They are so evocative and incredible. Glad they stirred up such a reaction, Cindy. It was fascinating exploring the place on my own so early in the morning. I must confess that I had a good couple of shivers down my spine, especially when the sun wasn’t up yet, and the interiors still filled with many dark corners. Rather spooky to say the least. remains, decaying in the sand! So glad I could take you there. It is a very special place. Amazing experience and wonderful photos. You are a never-ending source of amazing and fascinating sights and stories. I have an ancestor who left Bradford England to become a miner in South Africa in the late 1800s. I presume it was diamonds – but who knows? There is so much I could research on him if I had the time. I know he served in the Anglo-Boer war as a stretcher bearer (for the English), and then went on to have some type of SA government position before ending up in Australia via Canada. Who knows? He may have even straggled north to Kolmanskop. Another five hundred years, and it will be as fabled as the lost city of Atlantis. And you never seize to amaze me with finding all those weird and wonderful ancestors of yours, Gwen. Can you imagine the stories he could tell? He sounds like the perfect subject matter for another novel one day. And of course you would have to travel far and wide for that research . . . Thank you, Herman. Have you ever been? I can only imagine the amazing pictures you would take there. I know! My bucket list seems to grow much faster than the items I can actually tick off. 🙂 Namibia is one of my favourite countries, and the opportunities for photography is endless. I hope you get there some day soon, Herman. Absolutely stunning. I haven’t even heard of this place yet. Simply glorious photos. Thank you! Thank you, Manja. I had a wonderful time exploring this corner of the Namib desert. Such a fascinating history! Always look forward to your next adventure. Thank you for sharing. Thanks, Bev. I hope our adventures can intersect again one day. Michael seriously considered doing the next Cape2Rio, but work commitments got in the way. What a sad place! 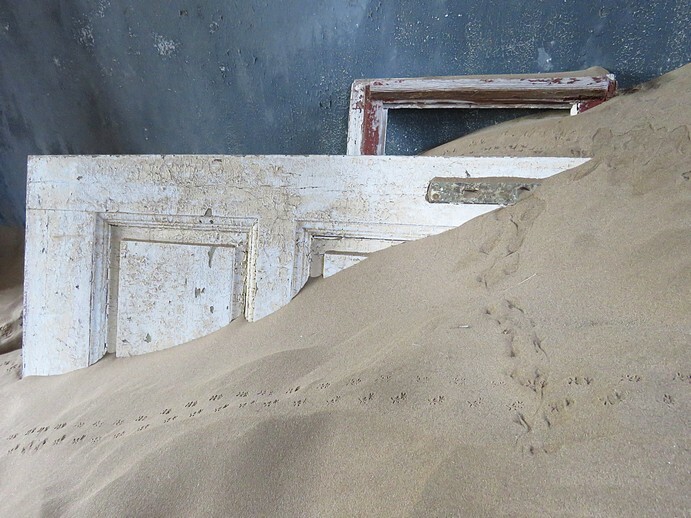 Your photographs are wonderful and the history of Kolmanskop is fascinating. Thank you, Clare. It is indeed sad to think that dreams and prosperity, even when built in stone so to speak, can be very fleeting. I’ve seen many posts about abandoned mines in Namibia, but the writing in this one outclasses everything I read so far! I, too, have a “thing” for abandoned places: I’ve spent lots of time reading about UrbEx in the USSR and, still, one of my most thrilling reads was the one when two Russians trekked the steppe and found the Buran shuttle in an abandoned hangar… Here’s to more such posts from you! Thank you for the compliment, Fabrizio. It took me quite a while to write this post, as I struggled to find the right angle. I marvel at how many abandoned places there are in the world. And the stories surrounding them are just fascinating! Definitely something out of the ordinary shown today. I am certain if the walls could speak, a very thick novel could be written of the happenings that went on inside these now abandoned buildings. Indeed, Greg. It would make for a riveting read. It must feel surreal to see this in-person. Your photos – as always – are stunning and are a wonderful combination with your writing. I feel as if I am there myself 😉 As always best wishes! “…even though it was a tad creepy at time” – I think I can relate! But very glad you enjoyed the experience. On a side note, I left a comment on your other blog (A Taste of Freedom). It appears I’ve somehow accidentally un-subscribed from receiving updates and don’t know how to subscribe again…. 😦 Worst case scenario, I have the site bookmarked, and will check-in regularly. Hi Takami. Will hop over to our Portugal blog quickly, and see what I can do. Will respond to your comment there. Wrong button pressed…. 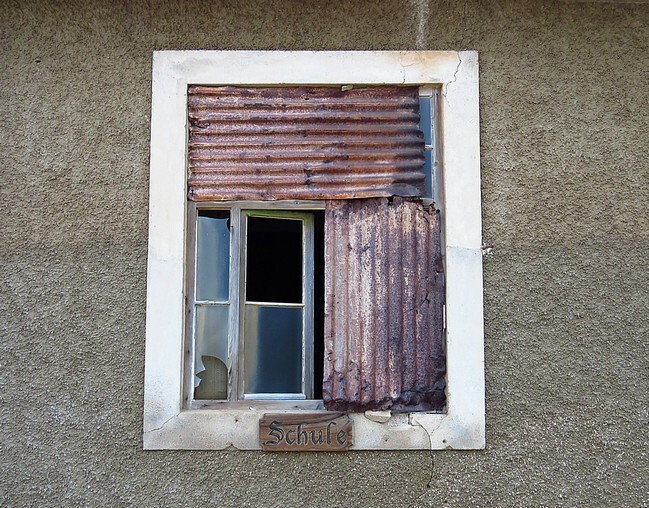 now I’ll finish…what a statement about humanity and what is happening to us with all our excesses….eerily poignant I find myself most drawn to the half drowned doors and windows…. must have been amazing. It was truly amazing. One can really get lost in time there. Fascinating history lesson. Great snaps, even if they seem a bit depressed and haunted. Thanks, Lani. Yip, I did feel goosebumps creeping up my spine a couple of times . . . I wonder about the same thing, Lexie, especially when I visit abandoned places, because I am sure that the people who built and inhabited them could never have imagined what fate would befall them. My husband hates visiting places like these, as he says it saddens him too much to think that the crumbling buildings once contained peoples dreams. Love the photos Jolandi, they certainly tell a story. They gave me the same feeling as I get when I stand in a ghost town near my hometown and wish the walls could talk, oh the stories they could tell. You took us all there with you and I loved reading about this lost and forsaken spot. Indeed, Terri. I am definitely attracted to these places partly because I am drawn to stories, both real and imagined. I could easily have spent the whole day there, as it was quite overwhelming, but the wind was very unpleasant, and we had a long drive ahead of us. Wow, so many grains of sand, what a mysterious place, the desert.